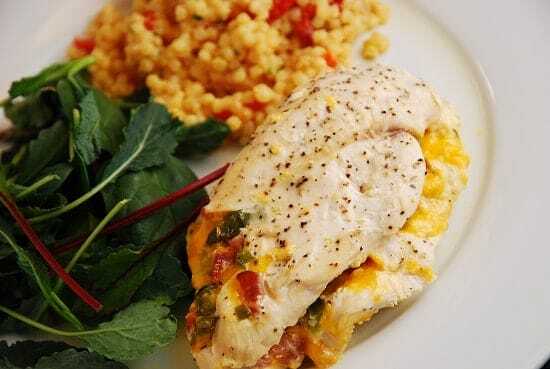 You get more bang for your buck with a jalapeno popper by stuffing it into a chicken breast, in this Jalapeno Popper Stuffed Chicken Breasts Recipe. The chicken comes out oh so tender and juicy, and the delicious spicy, creamy, bacon-y center provides the perfect kick. It’s a perfect, low Points Weight Watchers Chicken Recipe for an easy and unique weeknight dinner. It would also work for a sophisticated Super Bowl Sunday dinner recipe! If you love jalapeno poppers, this recipe is a must try. Enjoy! A delicious and healthier way to satisfy that craving for jalapeno poppers, these season chicken breasts are stuffed with cheese, bacon, and jalapenos. Quick, easy and incredibly satisfying, it’s a perfect Weight Watchers dinner recipe. Preheat oven to 375 degrees. Spray a shallow baking dish with non-fat cooking spray. Using a mallet, pound out each chicken fillet to get a larger, thinner fillet, and then season both sides with salt and pepper. In a medium sized bowl, combine cream cheese, broth, cheddar, jalapenos and bacon. Spoon the cheese mixture onto on half of each chicken breast fillet. Fold in half to close, and secure with a toothpick. Place into baking dish and cover with foil. Make a few holes to allow steam to release. Bake in the oven for about 30 minutes, or until chicken is cooked all the way through and is no longer pink in the middle. Made this for dinner last night… Delicious! My husband went back for seconds and almost thirds! I made the jalapeño stuffed chicken for dinner tonight. It was so easy to make an had an amazing flavor. Loved, loved, loved it.